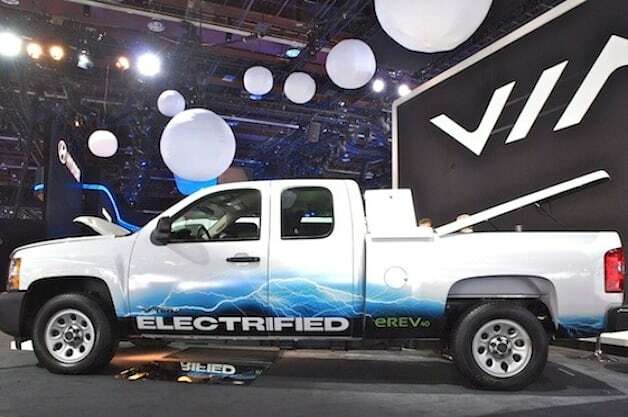 via motors phev truck productionWell at least it wasn’t the governor of San Luis Potosi, Mexico who was crash-testing a Via Motors extended-range plug-in hybrid truck. Because that would’ve been weird. This week, Via opened its first-ever production assembly line – located in that central Mexican state – and celebrated by having Gov. Fernando Toranzo take one of the company’s pick-ups out for a spin. A safe one, we surmise. Via says it located its new factory in San Luis Potosi because it’s in a free-trade zone and close to the General Motors plant where the bodies of the Via trucks are being made. The factory will be able to produce as many as 10,000 vehicles a year and is conveniently located next to the Kansas City Southern Rail Line. Via unveiled the plant after confirming that its trucks passed crash tests earlier this month. In early October, Via said it won a $20-million contract to supply vehicles to California’s South Coast Air Quality Management District (SCAQMD). The company will sell PHEV pick-up trucks, cargo vans and SUVs, and says its vehicles can go as far as 40 miles on electric power and reach a fuel-economy figure of more than 100 miles per gallon (equivalent). Check out Via’s crash-test blog post here and read Via’s press release below.